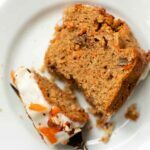 This healthy carrot cake recipe is made using almond and quinoa flours, and is naturally sweetened and uses applesauce to reduce the amount of sugar and oil! When I was a little girl, I always used to have carrot cake on my birthday. I'm not sure if it was because my parents thought it was healthier (there are veggies inside of course), or if it was just what my dad enjoyed baking (he's the baker in our family), but either way, my birthday cake was usually a carrot cake topped with homemade cream cheese frosting. At the time, I wasn't the biggest fan. It was the name that got me; I didn't want to be that girl that always had healthy food. I just wished my parents would make me a vanilla cake out of a box like all the other kids. It was so much more normal. How Do You Finely Grate Carrots? 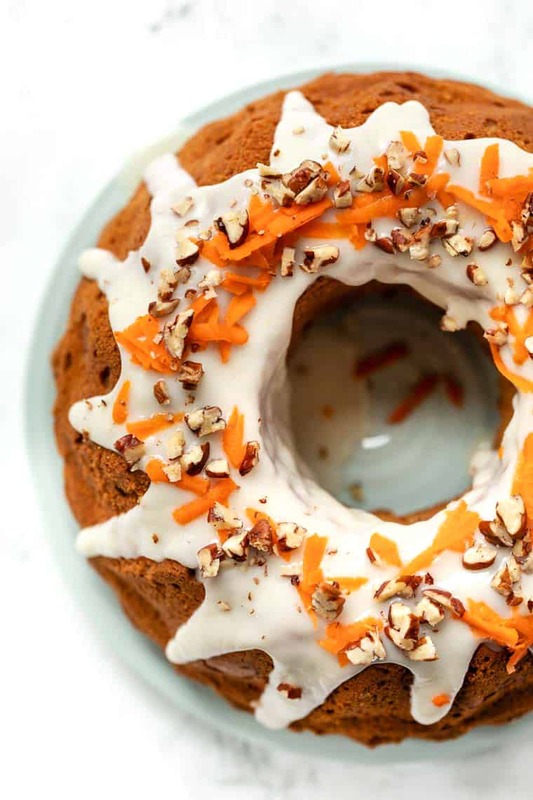 When I went to search online to see what questions people had about making carrot cake, I was surprised to find that not everyone knows how to finely grate carrots. Well, if that's you, I'm here for you! There are two main ways to grate carrots: with a box grater or in a food processor. This is the more time intensive, but a cheaper way to do it. If you don't already own a food processor, you can pick up a box grater for less than $20 on Amazon. It just requires a bit more elbow grease! To grate your carrots using a box grater, just use your hand to move the carrot up and down along the largest blade. 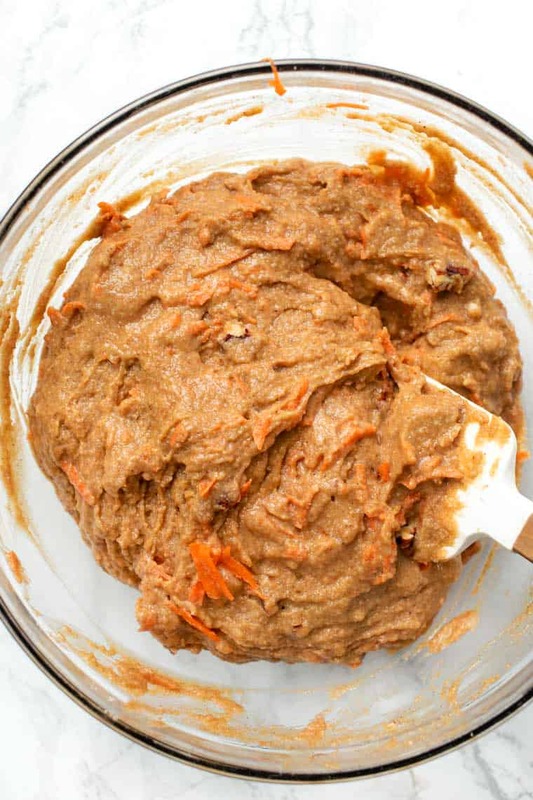 Since this recipe uses just about 1 medium carrot, it won't be too difficult! This method is an absolute breeze but also more of a pain to clean up (especially since the amount is so small). Most new food processors come with a grating blade, so you'll just swap out the standard S-blade, turn the machine on and run your carrot through the top hole. It's super fast, but again, it means cleaning your food processor which to me is a deterrent! How do you like to grate your carrots? Let me know in the comments! 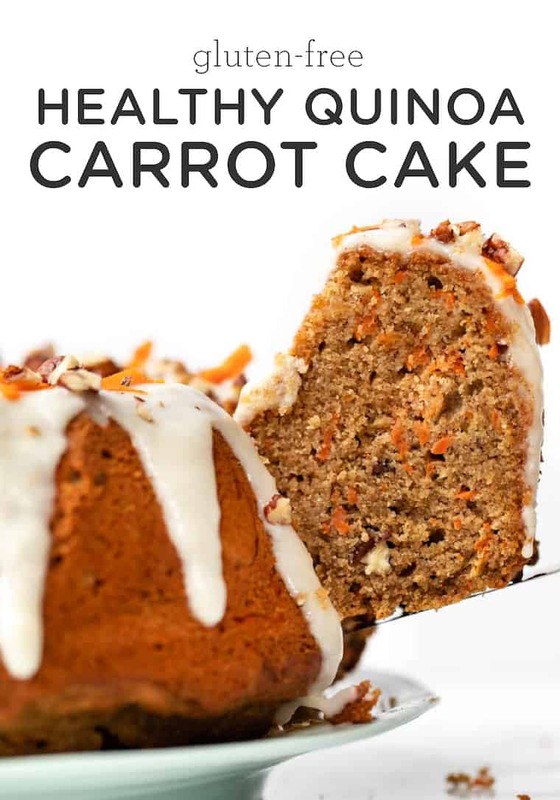 But here's the thing: now that I'm familiar with healthy baking and cooking, I've realized that traditional carrot cake recipes really aren't healthy. And that just because something contains a vegetable in its name does not make it good for you. In fact, I'd venture to say that carrot cake is almost worse than many other cakes. Loaded with vegetable oil, sugar, and white flour, and then topped with a mixture of cream cheese, butter, and sugar…yikes. 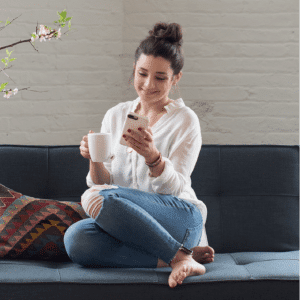 Definitely, something that I'm excited to lighten up and make give you a healthier alternative. 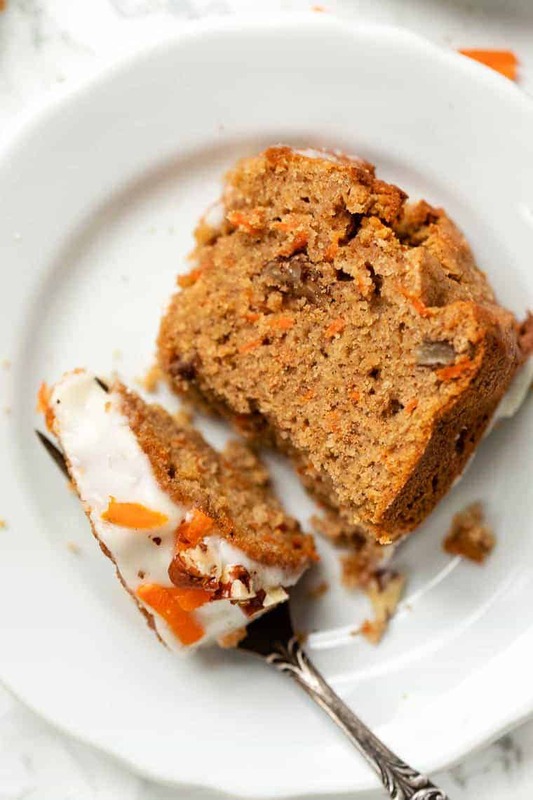 An easy way to make your carrot cake instantly healthy is to reduce the amount of oil. The reason for using oil in baked goods is to help provide moisture and crumb. So we can't just leave it out, we have to swap it for something else. My favorite solution? Using applesauce! You can substitute applesauce for oil in your carrot in almost exact proportions. However, when I'm baking I don't like to do all the oil in cakes because it does help give it a really nice, classic texture. You'll see below that we're using applesauce and yogurt in the wet ingredients. Those two things are there to replace 1/2 cup of oil. So in total, this recipe would have called for 3/4 cup of oil, but we're using 1/4 cup of applesauce and 1/4 cup of yogurt. You could also do just applesauce if that works better for you. So the long answer to that question is…YES. You can totally substitute applesauce for oil in carrot cake which will still keep it moist, but reduce the fat content by a ton! 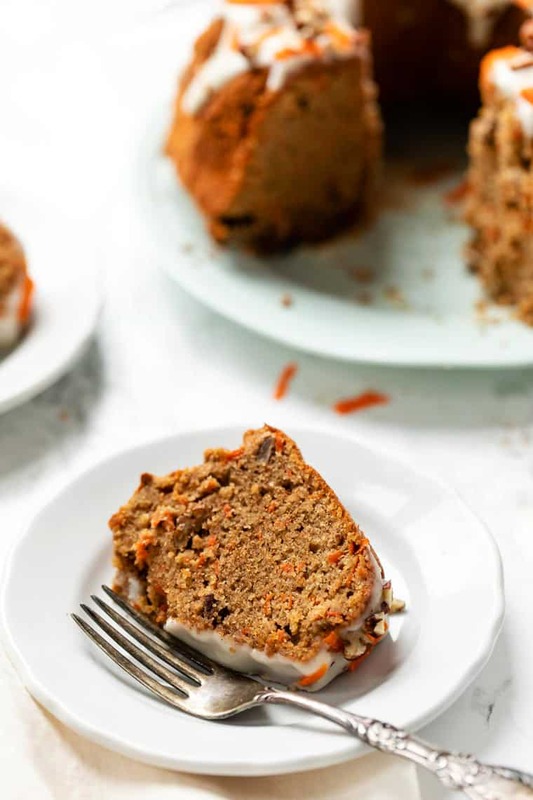 The flavors that go into this uber healthy carrot cake are what I love the most. I'm a sucker for anything with cinnamon in it, and I can't resist tossing in a sprinkle of nutmeg and ginger to spice things up a little more. Plus, a baked good with chopped nuts? I love the crunch! To make this healthy carrot cake actually healthy, I started with nutritious flours. The cake is a blend of almond flour, which is low in carbs and packed with healthy fats and protein, and quinoa flour, which is also high in protein and vitamins. Unlike other gluten-free cakes, there are no starches or rice flours. And finally, for my sugars, I went with something less refined – a simple blend of maple syrup and the natural sweetness from the applesauce. I love the flavors of both, and really enjoyed the level of sweetness they brought to the cake. What is most special about this cake is the texture. It's perfectly moist, has a soft texture, a slight crunch from the walnuts and a warm, comforting flavor that you come to expect from a decadent cake such as this. 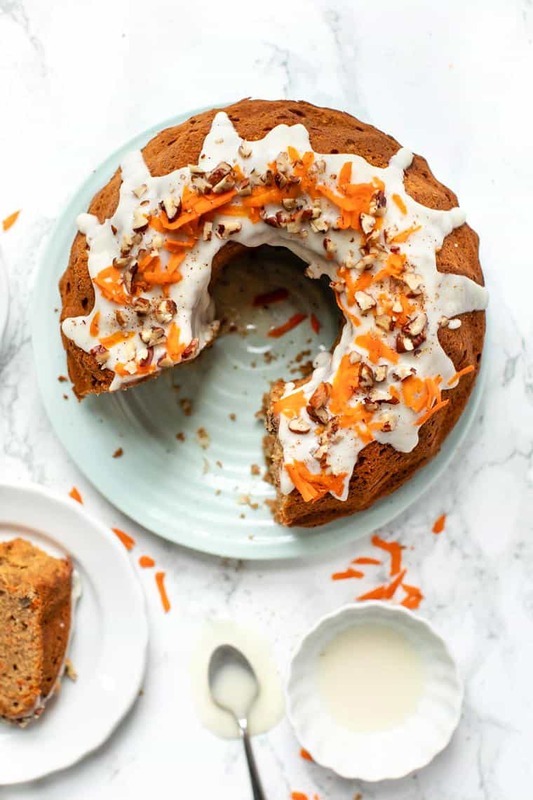 This healthy quinoa carrot cake recipe uses a blend of almond flour and quinoa flour for a light, yet tender cake that's high in protein and absolutely scrumptious! Preheat the oven to 350ºF. Grease a bundt pan and set aside. In a separate bowl, beat together the wet ingredients. Pour the wet ingredients into the dry ingredients and stir together until fully combined. 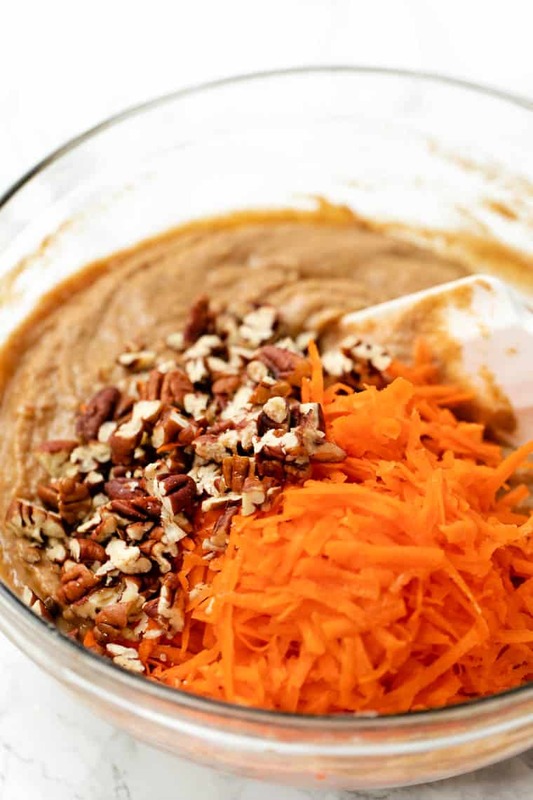 Fold in grated carrots and nuts. Transfer the cake batter to the prepared baking tin. Bake on the center rack for 40 - 45 minutes until a cake tester inserted into the center comes out clean. Allow the cake to rest for at least 10 minutes, then turn it out onto a cooling rack and cool completely before slicing. 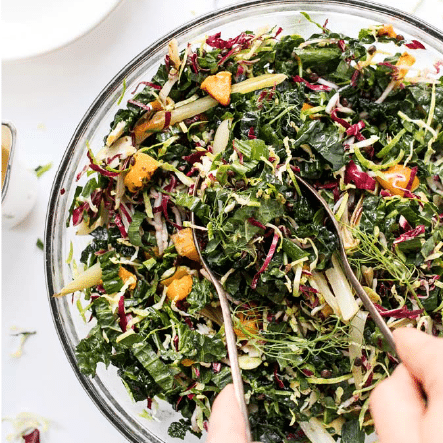 For serving, we love it with some drizzled coconut butter on top! Hi, is it possible to half the recipe and make cupcakes instead? The only thing I am worried about is trying to half 3 eggs – any advice? What would be the baking time for cupcakes? Lots of carrot cake lovers in my family, especially my mom-in-law. Can’t wait to try this recipe. I use a box grater for my carrots and I use avocado oil. All set now, thank you!! Can I sub chickpea flour for the almond flour? You could try, but I haven’t tried! I don’t think it will work due to the difference in texture and fat content, but you could certainly give it a shot! 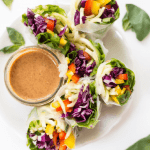 pinned to try this one soon, yum! I’m the same way about birthdays, but I don’t even really like cake – with the exception of carrot cake 🙂 Something about it is very nostalgic for me, but I have no idea why! I love your version and the fact that you used a blend of quinoa and almond – I find all almond flour baked goods don’t sit well. This recipe looks so good. 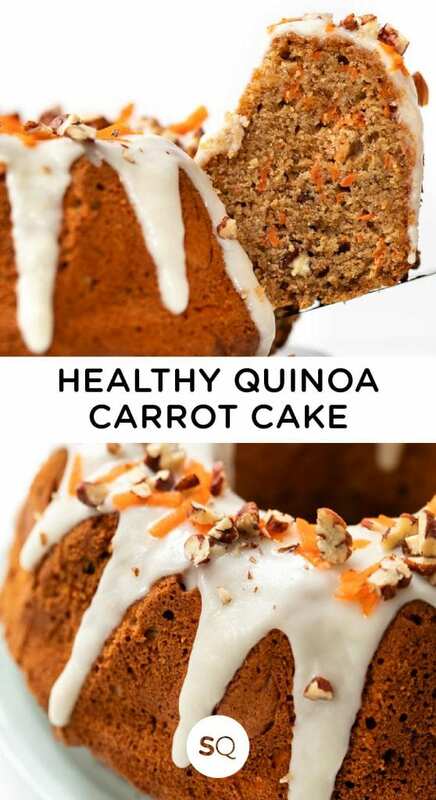 How can you go wrong with quinoa and carrot cake? I think I will love it, have to do egg substitute so here is hoping it works! There is so much controversially around coconut oil. Some swear it is really good for us and others it is murder in a plate type of thing. As a result I have. An untouched jar in the fridge door and. Just have not got there so any information is marvellous. Thank you allyson! I am not a fan of using any oil, let alone coconut oil (follower of Dr.Esselstyn). So, I am also wondering if there is a substitute for the oil in this recipe? I would not mind eating it without frosting . . . But what about that 1/2 cup in the cake?? Thank you!! And welcome, Anna 🙂 Glad you found me and am thrilled you’re liking the looks of the recipes. Would love to hear if you try the cake – it’s one of my favorites! do you think this would work with ALL almond flour? Wow, this looks delicious. Kudos to you for coming up with a way to re-make such a traditionally sweet cake. I wonder how low you could reduce the honey (even skip the syrup?) as an experiment. Just an idea: you could add pure pumpkin puree and cut back on the sugar. Not that it’s bad… just the creativity of your recipe has got me thinking! Would love to hear if you ended up trying a lower sugar option. 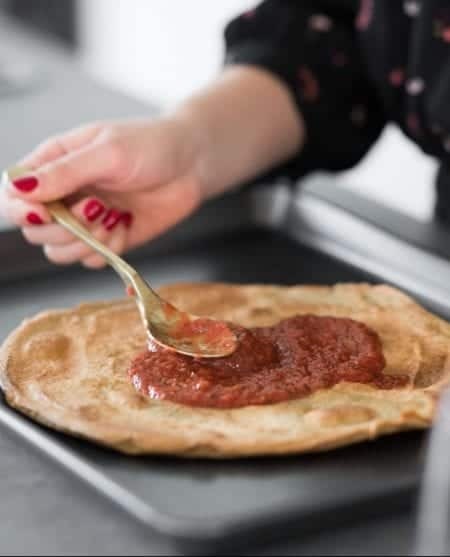 I think you could get away with reducing it slightly, but to be honest, I’m not the biggest fan of cake with little sweetness 😉 Still, most certainly am interested in hearing your take if you give it a try! Yes, those eggs, flax or chia or egg replacer (have any Americans tried the one from Ireland at any one time, things change!) but the replacements are always American and we cannot get them! I think because of the international sharing that recipes should now have one or two notes at the bottom so those with other challenges can meet them and not miss out pleasures like carrot cake. It seems early BUT xmas cakes are made months ahead and a recipe with different additions would be really appreciated! Can I substitute brown rice flour? Maybe add some nutritional yeast? Coconut oil upsets my stomach. Any suggestions for a replacement? I really want to give this recipe a try! Any other light flavored oil should work – light olive oil, grapeseed, melted vegan butter, etc. Enjoy! Thank you thank you thank you. Son is celebrating his 21 on Saturday. Carrot cake is his all time favorite but he hates to eat it because it is a “fat bomb”. He will be so thrilled and surprised!!! Looks yummy (as expected!) but can I use an egg replacement like flax or chia eggs? What would you recommend using in place of a bundt pan? Just wondering if there is anything that can be used in place of the almond flour – for those with nut problems? Hi Helen, unfortunately without some testing I can’t say what would work to replace the almond flour. Blanched almond flour is very particular and I’m afraid your ratios would be off if you substituted it for another flour. You could try creating a seed flour (pumpkin perhaps? ), you’d just have to make sure it’s ground up really, really, fine. Somthing’s wrong with your “frosting”. First of all it says 1-2 water. I assume that’s tablespoons. Second of all there is nothing but liquid, oil and cinnamon. Are we perhaps missing powdered sugar? Thanks for the note, Shari. I fixed the issue with the water ingredients, but the rest of the recipe is correct – no powdered sugar needed! The only sweetener used in the frosting is honey. Once you start to work with coconut butter you’ll see that you don’t need any dry ingredients. And needless to say… I also adore quinoa. It’s so to easy to print off the recipes …Can’t wait to try them out.